This is especially true in my sewing room. Because really – who wants to sew in the dark? NO one. The more light, the cuter your projects. It’s a rule or something. So I’m super excited about my new sewing table OttLite! I’m sharing all the things I love about it – and I’m having a giveaway so a lucky winner can experience the awesomeness too! My new light is the OttLite Extra Wide LED Table Clamp Lamp. Let me tell you – if you love a lot of light, you are going to love this lamp! It is a table clamp lamp so it clamps right to the back of your work table. The clamp is adjustable so it will fit almost any size table. I love that it shines light on the work space without taking up table space! 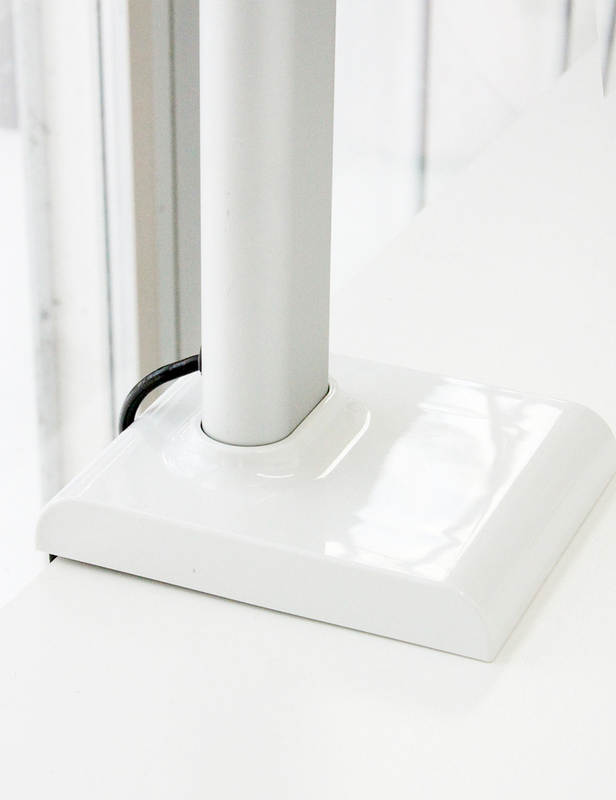 Look how narrow the clamp is – even if your table is against the wall it should fit! The neck of the lamp is adjustable but it’s not one of those adjustable lamps that feels loose. It’s a smooth flexible adjustment that goes from 16″ tall to 24.75″ tall. Such a great range! You can tilt the lamp too so if you need light to the left or the right it’s an easy adjustment. The light shade is 19 1/2″ wide. Hellllloooo light. It also has three color settings and 5 brightness levels. I like to keep it on the cool white setting and then adjust the brightness as the day gets darker. This is especially great during winter when we lose our light outside so early! Another cool aspect is the shade of the bulb. This isn’t for everyone, but if you are a blogger, take product photos or just like to take pretty photos of your work, the shade almost makes the light function like a photograpy lamp. So you can get bright white light for photos with no glare or harsh shadows! You can find out more details on the lamp on the OttLite Website! Wouldn’t this be great for so many things? Sewing, embroidery, painting, crafting, even just working at a desk! I think you would love it! 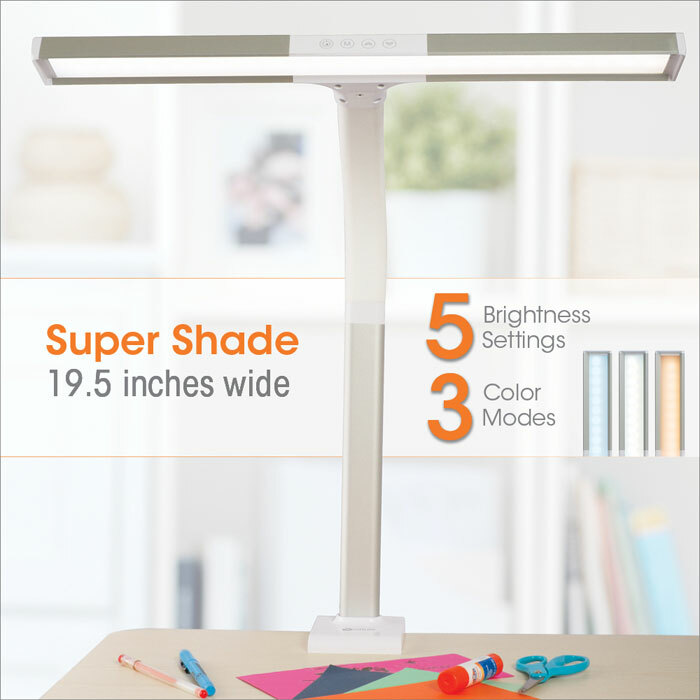 I’m partnering with OttLite to give away a fabulous Extra Wide Lamp to one of you! Enter on the Rafflecopter below – good luck! My friends all talk about Ottlight and found most too small. This would be a perfect size. I have seen the Ott Lights and they look AWESOME!!!! I would use this light behind my Aria, in my sewing room. The light is TERRIBLE in there! I would use this light clamped to my cutting table. I need all the light I can get my eyesight! This Ottlite looks like just what I’ve been looking for! I need two of these wonderful Ottlites! I definitely need one by my sewing machine AND one by my cutting table. I would definitely use this Extra Wide LED Ott Lite on my cutting table! We all need all the light we can get when cutting out fabric pieces. I love to wide area this light provides along with the height adjustability! Great for us quilters! I am with you about bright light, especially in the winter, since living in the Pacific NW, the light is often very soft and dim. I struggle to see details and colors well. And doing handwork is a real challenge! the flexibility that this light would give me would be wonderful. What a cool lamp! That would be very useful to me when working on embroidery, beading and other small crafts. At my age I need all the extra light I can get, lol! Thanks for sponsoring such a nice giveaway. Awesome lamp! I would use this in my craft/sewing room! Ottlite’s are great!! I would use mine doing hand work while in the living room or in my sewing room!! My 59 yo eyes would love to use this on the table I make jewelry on. Thanks for the chance to win! I would use the extra wide ott lite on my craft desk. I would love to win. My husband could use one of these on his piano. I would use it in my ironing area. I have a floor lamp OttLite at my sewing machine. I’d use it in my sewing area. What a great lamp! I would use this in my sewing room to make seeing what I’m doing in there easier! I would use this on my kitchen table where I cut and sew. With my eyes, I need all the extra light I can get. Thank you for sponsoring such a nice giveaway. I would use this attached to my crafting table which is in a room where the overhead light is terrible and even though I have a floor lamp, the light is still awful. thank you for the chance to remedy this. Where can I find the 30 minute Jewelry book, I am a beader as well and that light would help on my craft table. I would use the Ott Light on my cutting table. I would use this light where I hand stitch. Even though I work near a window and a lamp it’s still dark and I find that I unstitch more then I would like too. Thank you for the opportunity to win a terrific light. I could really use this with my sewing machine. I don’t have good lighting in my sewing room and this would be great to use! 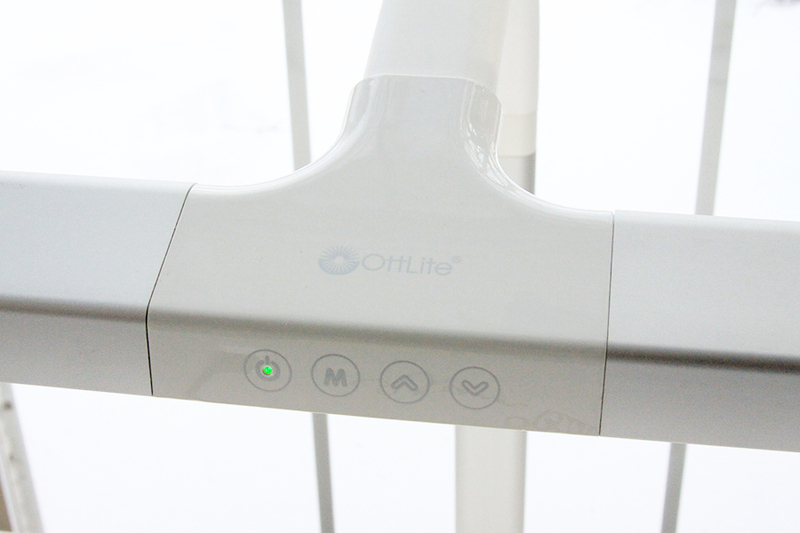 I always read such wonderful reviews of Ottlite, …but have never been able to get one…I would use it in my making space. Thank you for such a special giveaway! If I had one if these great lamps, I would use it all over my house!! I would take it with me to each new task. Then again, with all that light, I might see too much dust and dog hair!! Maybe I’ll just keep it in my sewing room. I’ve been looking for an Ott-Lite for my sewing table. I went to sew something one day and since it’s winter it was hard to see well. I could really use this in my sewing room. I would use the Ott-Lite at the sewing table in my sewing room. I think I’d use this on my sewing table. It’s not the best lighting there, so it’s difficult to see what I’m doing sometimes! Oh my! I could use this SO many places with hobbies and my line of work. Light is critical. Plus many other uses too. My husband and I fix things. Would love this. Going to visit their page. I would use the ott light on my sewing table. I can certainly see a abuse for this. I would use it on my cutting table which is against the wall. I would use this light on my sewing machine table. My living room\sewing room is incredibly dark. I would use the OTT light so I could see my sewing!!! I would use this above my ironing board and cutting table! I can always use more light at my cutting table!! Thanks for the awesome giveaway!! I’d use this on the back of my sit down longarm machine for maximum light! I just moved my sewing studio to the basement — I need this light to help replace the southern-facing window I gave up! Thanks for the fun give-away. This would be perfect for my cutting table! What a great thing to have. I’d use this when sewing. It would just fit on my machine table. Would love to have this light for my sewing table. Thank you for the giveaway. I’d use it in my sewing space, which is in the basement. Probably at the cutting table. I can use as much light as I can get in there! It would definitely go on my craft table. I would place it next to my sofa, it’s too dark there to sew by hand, but it is the most comfortable place for hand sewing! I would use this light in my sewing room. I do quilting and a light like this would be so great to have. I need good lighting at my craft time. I’d use it with my juki for fmq!!! Looks like the perfect light for crafting. Definitely could use this in my sewing studio! I would use it next to my sewing machine. That’s where I need the most light. Thank you for a great giveaway. What a great light! I have a little table in my sun room that I place my sewing machine on and space is really a priority. This lamp would provide the light I need overhead without taking up too much space. What a great product! I could finally see what I am sewing at night with this lamp. I have a small light and this light would make my aging eyes happy! I would love to use this lamp at my sewing table. I use the guest room, so I can’t install lights over my table. This would be awesome! I would use this on my crafting table. I would use this in my craft room. It Looks like it is a perfect light for so many areas. I really could use a light like this! My cataracts are getting a little worse each year, so it is getting harder to piece and sew. I have tried a lot of lights, but they just aren’t bright enough to see very well. I will need to start saving for one of these beauty’s. Thank you for the chance to win one! oh my gosh, I need this in my craft room!!! Looks like a very nice light. I agree; trying to work in the dark is the pits. What a great product! I would definitely use this in my sewing area of my sun room. I have a small table that I sew on and space is a priority. I love that it has a wide light directly over the sewing machine. I will be able to finally sew at night! My sewing room was a bedroom and has 3 windows which let in a lot of light but when it gets dark I cant see without some extra lighting. I love the wide ottlite. On the cutting table! I have a hard time seeing all those ruler lines! I don’t have a dedicated sewing room…..just our dining room table that does some serious multitasking. Not much light in the dining room so this wide Ottlite would be greatly appreciated…..I love lights blazing all around, too! I would use this in my newly remodeled sewing room to replace my old ott light. Love how wide it is, and that it is LED. This lamp looks awesome….there is not enough light for me! I too have all the lights on in my sewing room and this lamp would be a great addition to that room! Thanks for the opportunity to win this light, as well as giving a review. I may need to add this to my birthday list! The older I get the more light I need for crafting…well…to be honest…at just about everything I do…lol! This lamp looks awesome! I love having as much light as possible in my sewing room, so this light would be a wonderful addition. Thanks for the opportunity to win this lamp. That looks fantastic! I have very poor eyesight and lots of light is essential for me when I’m crafting. Especially during the dark winter months! I would love to win this Ott light. I have a floor model that I use while doing hand work or knitting. The Ott light I have on my sewing table is not adjustable in height so isn’t what I need. Love the idea of it being height adjustable with different lights. I had beautiful natural light until my husband blocked it off to utilize the space for storage. I love my light too, not to mention older eyes, lol. I have a smaller OTT lite and love it. This one is so neat. I love the size and that it clamps in the back to save space. Thanks for the giveaway! Thanks for the chance to win this light. I love to embroider and I think your designs are inspiring. Definitely could use this on my work table. I sew ,quilt, plastic canvas stitching and diamond art canvas work. This would be great lighting for the “DETAIL” work on all of my projects. Thank you for the give away chance. I would use this where I do my hand stitching. I know it would be a great help. I would use this in my sewing room as well as my kichen, which is my cutting area! I would use my ott light in my quilting room!! It would be a wonderful addition to a room that sure could use a good light!! I’m like you, I want lots of light! I would put this wonderful light on my cutting table. Ott Lites are the best! I would put this Ott on my cutting table and finally be able to see what I was doing! This light would be perfect for my papercrafting! I’m with you, never enough light! Would use in my studio. This OttLite would be perfect for my new sewing room, as it only has one window in a 20×20 foot space. I will have my electrician install ceiling lights, but since I teach young people to sew, I will need a lot of task lighting! I love that this one is extra wide and can be adjusted in height. Love this and all ur stuff Beverly!! Thx for giveaway! Wow, I would love to have this bright light at my sewing table. It is in a corner and it’s difficult to see the project without casting shadows. This lamp would take care of that! Thanks for organizing the give-away! The main place would be on my sewing table as I quilted, but I would take it with me when I crafted somewhere else in the house. That sounds like my house. Would love to have more light!! I would use the extra wide Ott Light at my cutting table. I think the Ott Lights are the best lighy you can find! I’d use it right over my sewing machine. This would be a great benefit to any crafting room. Thanks for the giveaway. This light would go on the quilting table! I just found your site and shared ti with two friends yesterday! I am so excited to get back to sewing and you are my in spiration! The light would be perfect for me as I went to the eye Dr.this past week and lets just say , I’m not as young as I once was. Thanks for the opportunity! I have been in the need to purchase one of these for a long time and just never seemed to find the right one for the limited space I have in my camper sewing area. Great find! Thanks for sharing! Wow! That does look very impressive. I could use that in my sewing room VERY BADLY! My room is like a dungeon and needs so much more light than I have currently. I have just one window in this room which is only about 28 inches wide and then right outside the window is a portion of the back of my house that continues back into the yard. This part of my house blocks any light from coming into the window and to the right of the window is a line of very tall thick evergreen trees. And then, on top of that, this room is at the back of the house which gets sun ONLY as it is going down at night. Sadly when that sun does finally come into my room, for the tiny bit of time it does, it’s blinding because it is so low in the sky. Not the best time for the sun since at that point of the day, it blinds me and I have to close the curtains. So yea. I need MUCH more light. I LOVE how wide this OttLite is and how it has different color settings. That’s awesome, because while reading it helps when using the computer or reading if it’s a green light, but that’s not the most ideal color when doing other things like cutting fabric. What a great idea! I have 2 OTT lights and although, I like the way they help me see my projects more clearly, I often have trouble positioning them for the best use. I love how little room this takes up on a table while still providing a wide area of light. Being able to choose between 5 levels of brghtness is perfect. Too bad Christmas is over, this would definitely be on my wishlist. Thanks for working with OTT to offer the giveaway. Oh, this would be perfect on my studio work table! I was just trying to figure out my lighting sitch there last night! Oh definetly by my machine. Oh wait, at my cutting table! Great give away! I love Ott lights! I would clip it on my sewing table. I’m with you! I NEED light! Especially as I am getting older. I would LOVE this in my sewing room!!! This light would be grea In my sewing room! I own two Ott lights and really like them except for the fact that they have bases that take up a lot of space on my sewing table. I’d use this on my table that I put my new sewing embroidery machine on. It would be perfect! I never saw a light like this and I love it I would put it in my sewing room. I am a senior and my eyes need lot of light. The first thing comes to my mind when I enter is Let there be light.” Thank you for giving me a chance to win..
On y sewing and crafting tables! I would use the OttLight on my sewing table which is also where I cut, iron, etc. The small footprint would be a big help. I do BIG needlepoint projects and I would put this on my stand! Great light! I have plans to set up a new studio next month and this would be a perfect addition to my sewing table. Thanks for the giveaway! I love Ott lights! I would put this on my sewing table so I could see better! I would brighten up my work table in the craft room in the cold, dark, winters hours of Alaska. Thank you for the chance to win. Ottlite puts out such a nice clear light. I would love one for the office area. Thanks So much for the chance to win such a great product! I would use it by my sewing machine and also when I’m hand stitching my binding or cross stitching. I would use it on one of my vintage machines. It is located in a darker area of my sewing room. Thanks for the chance to win a light but also for reviewing the light so I know if it will do what I need it to do. This sounds like the perfect solution to my sewing room. I could use it in all the areas that I use to be creative. Thanks for the chance to win. perfect – my sewing room is dark and I need all the light I can get. I hope I hope I hope I win!! I would use this lovely light on my sewing machine table! Thanks for hosting the giveaway! I don’t like a dark room either! I always have trouble with shadows on a dark day while sewing , could really use a light like this there! I would love to own this beauty. At present I have two Ottlites to cover most of workspace. This would be a good solution. Definitely in my sewing room! My eyes are getting bad with age and I find I need more localized light, even on the sunniest days. Thanks for the opportunity to win! This is so great to learn about. I’m in the “give me LOTS of light” camp when I’m working on any project, which is most of the time! I’m adding this to my wish list – takes up less space than more fabric – ha!! I’ve been looking for a new lamp. The lighting in my sewing room is not good on gloomy days. I have two Ott lights in my sewing room but nothing this large. It would be great to add another, especially on these dark days on winter in the Northwest. I would use this light at my cutting table. I’m with you, let there be light! I would definitely use this in my craft/sewing room. when doing handwork. I would love to have it by my chair in the living room where I do my hand stitching. I have a little set-up in a closet that I craft in that could definitely use more light that takes up little space. I would use this light on my sewing machine, puzzle table, and bible study table! Love your blog and fabric and I love Ott lights! I say YES to all the light I can get for whilst I’m stitching! Great looking light & a good size. I love my OTT light. What a great contest. With my elderly, failing eyesight, this would be a tremendous help on my sewing table. What a great give-a-way this is. Thank you so much! Wow, perfect timing ! I’m starting several new projects ,and the older I get the more light I need, haha . I would place it behind my sewing machine! Never enough light at night. Confession time: I just finished reorganizing/cleaning my sewing room. I love Ott lamps so much that I have 7 and use them all! I do not have one by sewing machine and would love to win this one. This would make me so happy, all through the holiday as I quilted and complained about needing better lighting and this is the Ottlite I need. I could definitely use this light at the table where i work on sewing and crafts. It looks like a great solution. Thi s would be used right by my sewing machine on my dining table. I don’t have a seeing room so this would give me much better lighting. I would love to use this all over my house! Love that it’s LED and clamp-on! It could move with me, and even follow me into our RV! I would use this beside my sewing machine. Thanks for the giveaway. This would be great on my keyboard and sewing table! I have a large worktable in my sewing room and I always seem to have shadows over my work. I would use it there! I love Ott lamps. I would use this light on my crafting table. It would work perfectly there!!! What a great lamp! I didn’t know Ott made such a large clamp on lamp. It is wonderful and I could put it to good use on my cutting table. Love Flamingo Toes! Thanks for the contest. I would use this fine light, while doing my counted cross stitch and reading. My craft area is in an unfinished basement so I would use this OttLite Extra Wide Table Lamp on my sewing table in front of my sewing machine. This lamp seems like a game changer! Grey days in PNW, so good lighting is essential! Perfect size for my sewing table, the machine light just doesn’t cut it! That looks like a wonderful light. I’m with you. I walk through the house turning on lights all the time. Thanks for the giveaway. Totally need one on my craft desk!! I took a few years off from quilting while living overseas. Its amazing what I cant see anymore. I need every light on and, of course, my cheaters! This is an awesome giveaway. My eyes could use all of the help they can get. I wear glasses but to find good lighting is a chore. Thank you for the chance. The time you spend sharing your knowledge is wonderful, thank you. I’m a scrapbooker and this Ott Light would be WONDERFUL at crops and weekend scrapbooking retreats! On the desk for my sewing and reading. Love my freestanding ottlite. I can see how a desk top would be helpful especially given my aging eyes!!! Even if I don’t win, this is going on my sewing table. I have a floor ottlite that I love, but have to keep moving it around. This would be perfect. Thanks for the review. Such a great light! It would be so great in my sewing room! I love that lamp. It would be perfekt for my sewingtable! Certainly sounds like a fantastic light for my sewing space. I would use this wonderful light on my sewing table. My OTTlight is old and has a broken neck. The switch doesn’t work most of the time, but I love it so much that I continue to use it. I would love to replace it with a newer, wider, brighter version. I would use it on my sewing table. There never seems to be enough light when using my sewing machine. I LOVE Ottlite Lamps…I have a small book light sized one I received as a gift a few years ago, and I have a small desktop one with sewing notions holder that I bought about 10 years ago, but can no longer get the right bulbs for it. Would love a new one! Thank you for the giveaway! I’ve always wanted an Ott Light.. for my sewing and crafting! This one looks awesome and covers a nice wide area. I think having a light like this for taking photographs for my shop would also be so great. Would love to win it! I’ll go check it out also. My work table is right next to the wall, but I think I could make it fit. It would be so worth it! Love all of your projects too! I would put it on my design table where I lay out quilt ideas. I would probably move it over to my sewing table when I start sewing. I seriously use the overhead light along with 3 lamps, one aimed on my sewing machine, one on my cutting table and one on my ironing table. I would love to give this a try. The older I get (61) the more I need bright light! Thank you for the giveaway! My house is so dark! This would be perfect for my creative space! I now have three Ottlites to use around my home for all sorts of crafting, doing jigsaw puzzles, beauty routines, etc. I can appreciate the great products they offer every day. I’ve just moved my sewing area to another room with even less natural light than I’d had before and could sure use another dedicated to the space! I would love to win this light! Ott lights are the best! I would love to have one near my sewing machine as well as near the chair I like to sit in to crochet. I am exactly the same about lights. I want to see what I am doing. Love this light!!! This light will be perfect in my sewing room. Then, no excuses for not sewing once the sun goes down! What a great lamp. I would use it on my sewing table where I need lots of light. This would be a great addition to my sewing room! I agree with you on lighting. Can not stand a dark room. I currently have 4 Ott lights at varying places in my house but this one you are giving away looks fantastic. I would use it by my sewing machine. I love OttLites! And yes, I could use more light in my quilting room. As I have gotten older my need for light has increased. Would love one of these. Thanks for the chance to win. This would be awesome to win! I love the fact that it clamps on to the table and that it is wide! Oh I love that it’s a clamp. I need all the space I can get on my sewing table! And I sew in a dark room in the basement with a very small window….. so bring on the light!!!! That looks like a great light! This seems like a perfect solution to my poor lighting situation. I love Ott lights. I think I own 6 total and have given 2 or 3 as gifts! Love, love, love OTT lights. This would be great on my sewing table. I love the portability of the clamp on design which gives me more options for using the light as needed . I would use this by my sewing machine! I would use this when I’m knitting or beading in my living room. I like to be there with family, but the lighting is terrible. I would put this on my work table. Can never have enough light anymore! What a great looking light….just what I need! I’m just like you about bright light and fortunately my husband is an electrician. He replaced every light in the house when we moved in 18 months ago. He is like your husband who prefers less light so he put dimmers on everything and we play the game of turning them up (me) and turning them down (him). I have an ott lamp on my sewing machine, i think I saw it here on your blog and I’d love a big old work lamp like this one on my work table. I do a lot of sewing by hand and machine late at night. My sewing machine light bulb uses a halogen light which doesn’t provide much light-they stuck it up inside the machine for one thing and that’s when it decides to come on. i think the plug in is loose or something. It’s not unusual for me to hit the bed at 3 in the morning. I have an older daylight floor lamp but it’s a dull glow and I have two portable Ott lights I love because sometimes I cut fabric in areas where I don’t have a convenient outlet. Stretching extension cords across the room is an accident waiting to happen. Aging eyes is not helping much either. I do love LED lights and I like how this spreads across an area-reminds me of a hammerhead shark. I would use it in my sewing room. Whether in the gloomy daytime or at night I need all the extra light I can get. Thanks for a chance at this great looking light! This light would work great on my sewing table. I need this light in my sewing area! This is so exciting! I have been looking for a lamp with a good color read to use on my sewing table and for other arts. I love how flexible this could be for reading and studying in our mixed art/office space. THis looks like an awesome way to add some lighting to your sewing/crating spaces! I would use this on my sewing table. I need all the light I can get. As I get older it seems I need more light. I use a small Ottlite already on my sewing table but would love a larger one that clamps on. I love that I can see the true colors of the threads and fabric with this light. I try to sew at night and keep my husband company in the living room instead of my sewing room. It is very dark in there and would love the larger lamp. Thanks for the chance to win one. I sew and craft all the time and there is NEVER enough light!!! (Even though my husband think I have the Sun on) gThis would be an amazing addition to my tiny sewing area! Thank you so much for the giveaway! I cannot craft at night because of poor lighting. This would be such a tremendous help. 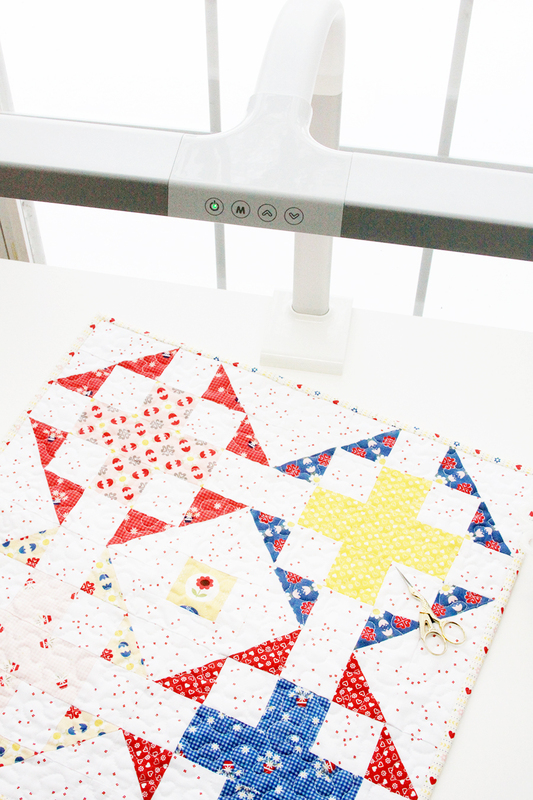 I would clamp it on my sewing machine table so I can quilt wee hours into the night!! I got a floor model ott light for Christmas and love it! I’d love to have this one by my sewing machine!!! Awesome! What a super neat light! I love that it changes brightness and color modes. This would be great for taking on retreats, where the lighting isn’t always the best! I sew at the dining table, I would use it there for extra lighting. I could use extra lighting in my sewing room. I have a smaller Ottlite, but this would be amazing because of its size. I’ve been hemming and hawing over getting an Ott Light for my sewing table. It’s not easy to see what I’m doing once it gets dark outside! Right over my knitting chair! I’d use this Ottlight in the craft room for magnificent help in seeing what I’m quilting! I have a cutting table in my living room, and I would love to have this light there. I have noticed lately how much more light I need when working on projects! I must be getting old! Lol! This would be great to win! Just what I need for sure! What an awesome lamp! I definitely need this in my sewing room. This would be fantastic for my sewing table! I’m a new reader and I’m having lots of fun reading old posts! Wow! That light is amazing! I love how much area it provides light to. I would use it either on the back of my sewing table or cutting table. What a beautiful light! Thanks for the great giveaway! I would use the lamp on my sewing/cutting table. This lamp would be great! I only have the overhead light & a lamp in my sewing room. It makes it really hard to sew at night. I could sew all night with this great looking lamp. Thank you for the chance to win & for the giveaway. God bless. Thank you for hosting a great giveaway! I could really use a lamp like this on my cutting table. I need this light on my cutting table. My sewing room faces east, so I only have good light for a few hours in the morning. I would love this light! I would use in the living room, where I like to work in the evening, while being with the family. I really enjoy your site, Facebook and Instagram posts. I would love the Ottlight as a flex light! It will move to what ever area I’m working in, sewing table, craft table, ironing and at my desk. I love and need good, reliable work lighting. This would be wonderful on my sewing table over my sewing machine….it would be a wonderful addition!! Thank you for the chance to win! Perfect size for crafting too! I would use this light on my desk in my office. This is so nice. Would love to win! Thanks for the opportunity! I would use this light in my craft room. Phew! There are a lot entering! Hope I win! I find I need more light on my work, the older I get! :-) Thanks!! This would be a perfect lamp for my sewing/work table. Looks like SO much more light! My crafting desk is the perfect spot for this new light! Thanks for the chance to win. This lamp would look great on my cutting table!!! thanks for the chance! OMG! This would be absolutely perfect for my Craft Island! It is 96” X 50” and I never seem to be able to get enough light without using 5 or 6 lamps at a time! This miraculous beauty would brighten my world and save on my power bill! I would definitely be ecstatic if I saw that I am the lucky winner for this fabulous giveaway! Thank you for the chance to win this! It would see lots of cards, calendars, albums, sewing projects, canvases and so many other projects being created! I’d love one on my cutting table which is where I do most of my crafts. I have a sewing station set up in my spare room, but I can only sew during daylight hours because I have yet to purchase a lamp! I would love to have this set up so I can start sewing all day and all night! I can picture it now in my sewing room. Luckily, there are two possible locations: sewing table and large crafting desk. What fun! I need all the light I can get whether is sewing, cross-stitching, or paper crafting! This would be fantastic in my sewing/craft room. I have a floor lamp that is very similar (although it is not an Ottlite). It has the brightness and color levels. Like you, I keep mine on the coolest white and tend to have it on the brightest setting. My oldest moved out recently and so I have moved my sewing/crafting things into his old bedroom. It is a much brighter room than what I was in, but still it gets dark at times. 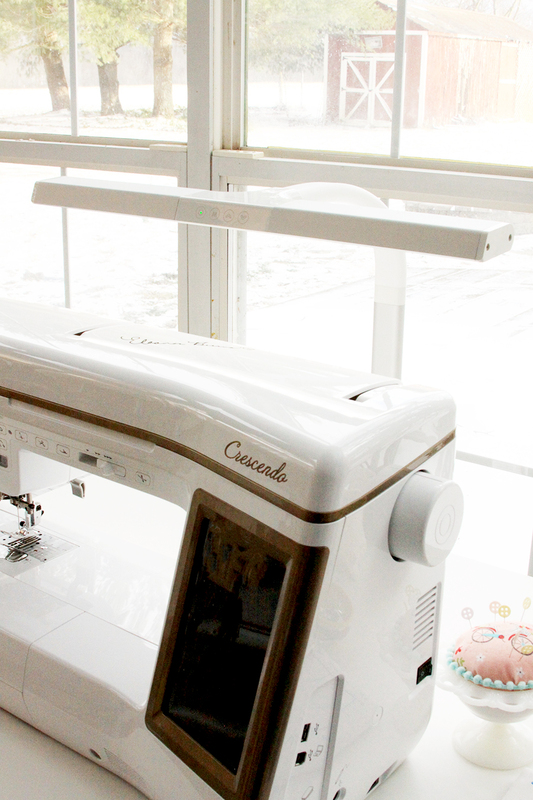 I would love to have a second light to use for behind my sewing machine. That would let me use the existing floor lamp in a better spot. It doesn’t fit well where I have it, but I need light by my machine. I do not like dark rooms either! This would be great to have! I could use this in my bedroom,. Dont have a sewing room so I play in my room! I have a darker tone room and never have enough light! I’d definitely use this in my sewing room. Thanks for the chance to win! I love my Ott lamps, extra warm idea with 5 brightness settings … ooooo! Just what I need for dull winter quilting days. This light would be fantastic in my sewing room! I hate having to squint to see where my needle is going. My reading / hand-stitching corner needs some brighter light! This is where I would use the wide Ottlite! It would be great to have this lamp on my sewing cabinet. I like the slimness of it. I’d love to have one of these lights! it would make my sewing space so much better. O M Goodness! This is IN.CREDIBLE!!!! I am working on putting my craft room back together and lighting is such an issue. (Especially since it’s going to be in a little camper!) I will be such a happy camper (get it, get it??) when I get myself this little beauty. Thank you for the post!! We don’t have a window in the room that I sew, this would be a blessing! I love OttLite lamps – they manage to have a perfect lamp for every situation! Wow that is quite the light! I have a smaller Ott light. They’re really nice! I used my OttLite when I am trying to match colors and patterns. This would be wonderful for me to have one for my 6 foot long table in order to see the details. A an avid crafter that includes scrapbooking, and cards as well as Mixed Media, mini albums and sewing. Have always enjoyed having a OttLite but bought a stand up one over 10years ago and could really use this one for the table. Such a great opportunity to win an Ottlight! With my aging eyes, this light would be awesome on my sewing table whether I’m piecing or free-motion quilting a quilt. Thank you for this giveaway opportunity. My husband loves minimal lighting and it drives me starting mad! Especially in the wintertime. This would be soo helpful with hand stitching AND seeing colors well. I would use this at our crafting table. It would go nicely on my table. This way I can see vbetter at night when the kids go to bed and it becomes me time aka when I do my hobbies. I would mount this behind my sewing machine. It looks like it would be the perfect spot. This would go perfect in my craft room where I stitch and sew a little! This would be perfect for my quilting space in the 5th wheel!!! I would definitely use this lamp at my sewing desk, my current light is not great when it is the night time. This light looks great. I took photos yesterday and repeatedly got a big shadow. This may be the solution. Would love one of these lights for my basement sewing studio!! I love your discription of this light and it sounds perfect for the 2 goals I for myself in 2019. Learn handwork. And learn to paper piece. I chose wool and just this past Wednesday started Christmas ornaments. So far so good. And last week was my first attempt at paper piecing. Of course I didn’t see the mistake until it was finished so now I have to tear out the whole thing :} but that’s part of the learning process so I’ll be ripping this weekend. I can think of countless places where this would be useful. I have several smaller Ott Light lamps and have even given them as gifts to creative friends who could use a little brightening up in their space. Thanks for the review. I would use the light on my sewing table since I too love lots of light. Looks like an amazing product with fab features to enhance any craft room. Thanks for sharing your review and for offering this generous giveaway. I’d put it in my little studio desk.